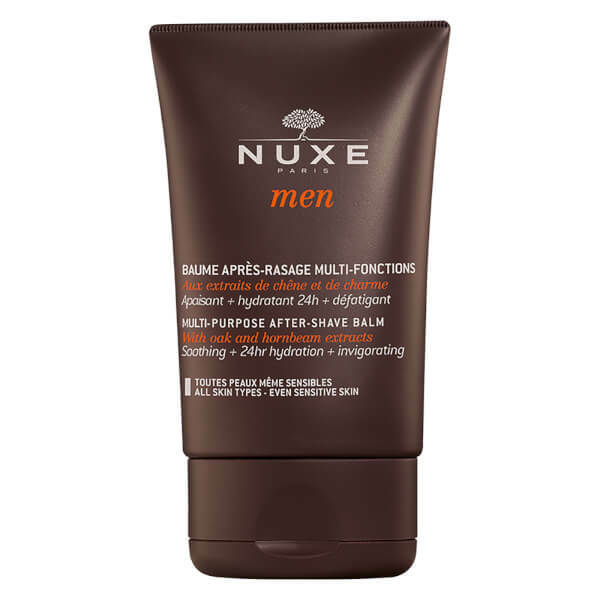 Boasting a nourishing, hypoallergenic formula, the Multi-Purpose After-Shave Balm by Nuxe is created to soothe and calm the skin after shaving. Working against razor burn and shaving rash, this non-greasy is suitable for all skin types. K.D. 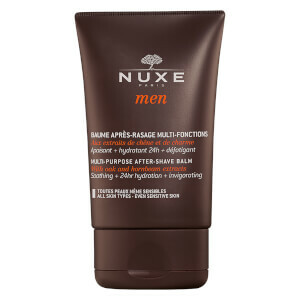 Apply this After-Shave Balm in the morning before shaving and/or in the evening. Ideal after the Multi-Purpose Shaving Gel for increased comfort and softness. Can also be applied over the whole face as a daily skincare product. Sandalwood and Phellodendron restores skin's moisture barrier. Extracts of Oak and Hornbeam repairs skin's defenses. Baobab Leaves have 24 hour moisturizing action. Aqua/Water, Propylheptyl Caprylate, Dicapryly Carbonate, Isodecyl Neopentanoate, Glycerin, Hydrolyzed Adansonia Digitata Extract, Lauryl Laurate, Hordeium Distichon (Barley) Extract, Arachidyl Alcohol, Glycol Palmitate, Hydroxyethyl Urea, Adansonia Digitata Seed Oil, Behenenyl Alcohol, Mannitol Hydroxyethyl Acrylate/Sodium Acryloydimethyl Taurate Copolymer, Tocopherol, Pentylene Glycol, Phenowyethanol, Phellodendron Amurense Bark Extract, Santalum Album (Sandalwood) Extract, Gluconolatone, Ribose, Tocopheryl Acetate, Arachidyl Glycoside, Parfum/Fragrance, Alcohol, Ammonium Glycyrrhizate, Sodium Benzoate, Sodium Hydroxide, Acrylates/C10-30 Alkyl Acrylate Crosspolymer, Tetrasodium Glutamate Diacetate, Polysorbate 60, Sorbitan Isostearate, Gymneme Sylvestre Leaf Extract, Butylene Glycol, Caffeine, Zinc Gluconate, Carbomer, Calcium Gluconate, Aesculus Hippicastanum (Horse Chestnut) Seed Extract, Araucaria Angustifolia Seed Extract, Carpinus Betulus Bud Extract, Quercus Robur Bark Extract [N1901/A].